Pacific Union College held its annual Fall Revival week from Monday, Oct. 10, through Friday, Oct. 14. Students participated in six services throughout the week, with a powerful Colloquy program on Thursday morning. PUC’s student praise band lead out the week’s colloquial service with, “What a Beautiful Name,” the theme song for the week. As the song came to an end, Campus Chaplain Jonathan Henderson introduced speaker Jason Francis, who serves as the associate pastor at the Ephesus Seventh-day Adventist Church in Columbus, Ohio. Francis stepped on stage with an energetic vibe and a smile on his face. 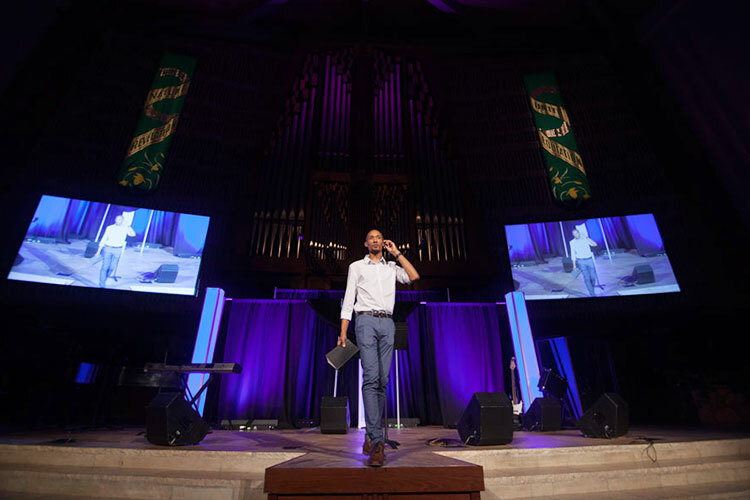 He began his sermon with the words, “God wants to turn something that is ordinary into something extraordinary,” a statement that echoes the theme of Fall Revival. “I’m glad he reminded us that God has the power to do that,” said Angel Hernandez, head resident assistant for Newton Hall. Francis asked students to open their Bibles to Matthew 5:13, the memory verse his sermon was based upon. It reads, “You are the salt of the earth. But if the salt loses its saltiness, how can it be made salty again? It is no longer good for anything, except to be thrown out and trampled underfoot.” Francis exclaimed the students at PUC are the salt of the world, an appeal for students to accept they have the potential to be used as God's instruments for change. Since students are the salt of the earth, Francis expressed the need for them to accept they are a part of Christ’s team, that God’s power could be harnessed in one’s life no matter how ordinary one thinks their abilities are. Francis exclaimed that God will use one’s ordinary abilities to make an extraordinary impact on someone’s life. “God is calling every single one of you here and He is saying, you, yes you, are the person I want to use to change the world, you, yes you, are the person I want to use to bring about a revelation, you, yes you, are the person I want to testify about me, you, yes you, are the one that I died for, you, yes you, are the one that I love, you, yes you, are the salt of the earth.” He paused for a moment to let the words resonate, while the entire sanctuary began to be filled with sounds of clapping.